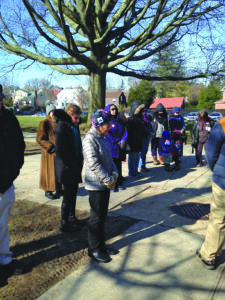 Members of the Oyster Bay community showed support for students by joining in the National Student Walkout movement on Wednesday, March 14, at Oyster Bay High School in the only way they could—by holding 17 minutes of silence in front of the school’s property, while a school sanctioned student walkout took place inside and behind the school. A couple dozen people turned up at the high school at 10 a.m. to advocate for stricter gun laws and to remember the 17 victims in last month’s school shooting in Parkland, FL, while high school students participated in a memorial inside the gymnasium. As the 17 minutes came to a close, Superintendent of Schools Dr. Laura Seinfeld came out and spoke to the group, thanking them for their support for the cause and for understanding that the school’s priority is to keep the kids safe. The group observed 17 minutes of silence to remember the victims. went outside in the back of the school while some chose to go the library. 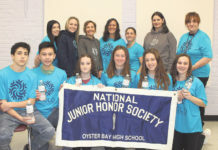 Linda McDonald-Nibert, of Oyster Bay, whose son attends the high school, participated in the walkout for several different personal reasons and shared a story with the group of demonstrators. 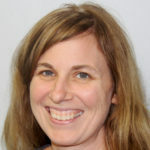 She is a cousin of Steven McDonald, who was a New York City Police Department patrolman who was shot by a 15-year-old boy in Central Park in July 1986; one bullet hit him in the neck, leaving him paralyzed from the neck down. At the time, he was 29 and his wife was three months pregnant. She said that, several months later, prior to his son’s christening in March 1987, McDonald received a call from the shooter, Shavod Jones, who apologized for his actions. 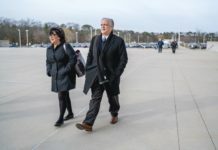 “Steven forgave him publicly at his son’s christening and he had every intention to speak about nonviolence with him, but when Jones was released at 23 years old—three days after he was released on parole—he died in a motorcycle accident,” McDonald-Nibert said. She noted that they never had a chance to meet after the incident, though he spoke about forgiveness throughout his life. McDonald died in January 2017. 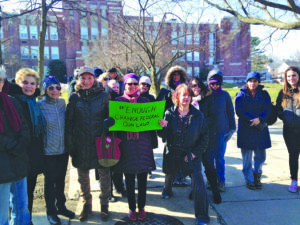 The group of demonstrators was organized by Oyster Bay resident Dr. Linda Peltz, who coordinated with Seinfeld prior to the walk-out to ensure they would be allowed to stand on school grounds. 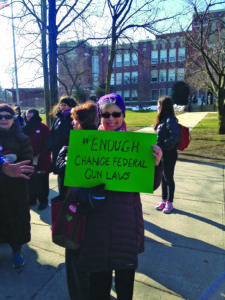 Peltz showed up with a sign that she held up proudly, demanding a change in federal gun laws. 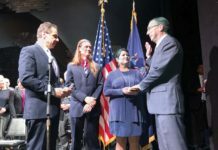 “Our goal is to let the local, state and federal officials know that we care about students’ safety in the school,” said Peltz.